This Thursday, a SpinDizzy style Thanksgiving feast is to be featured in Patch O'Black's "Thanksgiving Territories". Food by many SpinDizzy food artists, including Soul Fox will be served all day long. Don't know how to get to the Thanksgiving Territories? No problem, just enter "Park" on Thanksgiving Day as folks gather to eat, have fun and appreciate SpinDizzy. Join the crowd as we give thanks for friends, fur and our home in Space, SpinDizzy! Fine cuisine? Crazy cutlets? Cheesy chopsticks? Everything is found on Spindizzy. 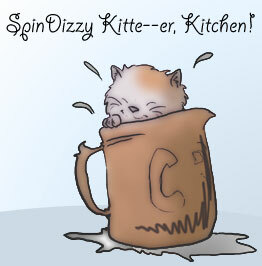 SpinDizzy Kitt--er, kitchen! highlights unique recipes from our local denizens with each issue. The best part about cooking is getting to gobble it down later. This starts out as a simple chicken dish, and can be made into stroganoff, a soup, or dumplings on the next day or the same day. It's a family or bachelor apartment recipe: easy to make, cheap to make, lasts a long time, and produces ingredients that go well into "remade" leftovers or other dishes. If you the "plain chicken dish" only, then you will only need 1 c. sour cream, half the package of fresh white mushrooms, and 1 package of onion soup mix. To make the base, get a large pot. Dump 1 c. (or 2 c.) of sour cream and the wine into the pot. Mix with 1 of the onion soup mix packages. Add the chicken, and bake covered at 350 for two hours. Towards the end, toss in 1/2 of the package of the sliced mushrooms. From here, your chicken is done, and you could serve it as-is. Other potentials are a rich soup or chicken and dumplings. If you're tired by this point, serve the chicken and use the leftovers for the stroganoff tomorrow. Just be sure to save the sauce! Once the mushrooms get to the point you want, add more sauce and some butter and flour, roughly 2 T a piece. When it finishes heating and thickening, turn off the heat. Add up to a half cup of sour cream. Serve this sauce over the noodles, and with the chicken. Ever wonder what SpinDizzy would be like if humans built houses and surrounded it with their version of "civilization"? What if cute furry little creatures who all spoke the same language and got along well were suddenly faced with the works of man? If so, you have considered the basic premise of Over the Hedge. This film is based on a daily comic by Michael Fry and T. Lewis. 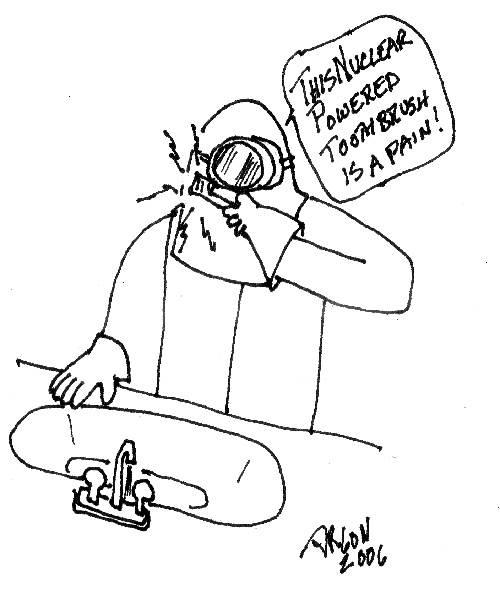 The comic has been running for several years and I always enjoyed it. The interaction between the characters is wonderful, and their interaction with learning to live the good life thanks to the Suburbians leads to laugh after laugh. I had hopes that the movie would live up to the high standards of the strip. The story begins with opportunistic raccoon R. J, voiced by Bruce Willis, trying to get a bag of chips out of a snack machine. When this fails he attempts to rob Vincent the bear, voiced by Nick Nolte. R. J. succeeds but still gets caught bt Vincent. In a daring escape, he ends up finding himself in a small bit of wilderness surrounded by houses. He meets a group of woodland creatures waking up from hibernation. 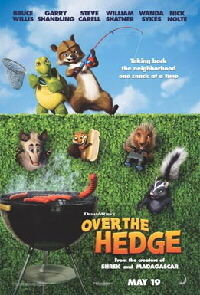 Led by Vern the turtle (a reptile, not an anphibian,) voiced by Gary Shandling, we meet Stella, the skunk voiced by Wanda Sykes, Ozzie the Opposum voiced by William Shatner, Hammy the squirrel voiced by Steve Carrol, and the rest of Vern's woodland "family". Yes, Family is a big part of this movie. As Vern's group awakes, Hammy, who is as hyperkinetic as a squirrel who's had a case of Jolt cola has to go. So off he runs and in a flash is back with news that there's something new! They all go look, and yep, it's the hedge. Their first venture through it into the suburbs is like Dorothy finding Oz, they are wowed by it. All except Vern who thinks sticking to the "natural" way is best. R. J, however convinces the group that with all this free food for the taking, why hunt and forage? With the appearance of animals in the suburbs, the humans call in the "pest" controller. This is the bad guy and he hunts our little furry heroes with a vengance. The movie is pretty funny and good family entertainment. No adult, or even teenage situations, and I found myself laughing hard a number of times. The feel of the movie's characters and situations doesn't quite match the comic, but it was close enough. It's all computer generated of course, and the visuals, especially the fur on the animals is absolutely amazing. The voice work is ok, with the exception of William Shatner who plays Ozzie the opposum. The opposum survival mechanism is to "play dead" when threatened, and Shatner gives his talent for overacting free reign and does some riotous death scenes. The DVD has a commentary track, some games, trailers and a short starring Hammy. Hammy used to be called Sammy, but once the movie became known his name was changed to Hammy. No reason was given but I suspected there was a Sammy Squirrel back in the day who's creator, or their ancestors wanted a piece of the profit pie. A search on Google for Sammy the Squirrel turns up a number of results, but I liked this one best. So the bottom line is this. It's worth buying just to hear and see Shatner die, and the CGI is, as I said, great. The story bears repeated watching. Out of 1 (stinks) to 10 (As good as but not better, as nothing can be better than, It's a Wonderful Life) I give it a solid 8. We're working on schemes to let people opt out of only the ambient noise, but that will take time to figure out. Please report if any of this doesn't work the way it should; we're still figuring out how this fuzzball ( The program the muck runs on - Ed.) thing works. You say, "I'm doing a survey for @Action News. The question this week is, 'Of all the movies and TV shows and cartoons and commercials we've seen with bears in them, which bear is your favorite?" Elissa yaps, "Fozzie Bear from The Muppets! Than says, "My favorite is Kit Cloudkicker!! His airboard so coolies!" Vixie says, "Bears? Whoy not foxes? Seriously, I'd have to say Yogi Bear, I grew up watching him." Andros says, "Sure. My answer is, 'Winnie the Pooh'." Chanspot laughs. "Ah, me. I'm afraid I don't have a TV...but the Coca-Cola bears are fun." Natasha says, "Ohhhh, probably Boo-Boo the bear... or maybe Rascal der Waschbaer. One of those." Nimble chitters quietly, "Rebecca Cunningham from TaleSpin." Suri says, "Were there any commercials where a Bear went berserk with a pushmower, and chased people around with it? 'cause that's the one I'd like best." Dusk says, "Almost forgot. How about Pooh Bear?" Marrisa, "I'd have to say, Winnie the Pooh."